My brother JJJ threw down the gauntlet first. He claimed to have fresh spinach in his garden last April, when the rest of us were just putting in seed. Plus he lives in Minnesota, so we were even more skeptical than normal of his tendency toward braggadocio. Fresh spinach harvested in early spring? In Minnesota?? Under interrogation during our summer family reunion, JJJ refused to break. We picked up two packets of free spinach seed. So what the heck. Despite our wretched record growing spinach (we’re 0-3), we decided to put in a fall crop. And even if that fails, we’ll put in a winter crop too. The fall crop went in yesterday. One varietal is spinach Medania, which Thompson & Morgan promises is “easy to grow” and “reliable.” The other is Palco F-1 Hybrid, which promises a long season if we can get it past the bugs and the deer. JJJ says he plants his winter spinach around Thanksgiving, then patiently waits for it to sprout when the snows finally melt in Minneapolis. We’ll aim for Christmas, since we rarely get a hard frost here. I’m crazy about spinach. 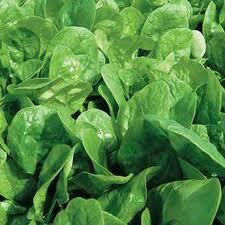 As Popeye knew, it’s rich in Vitamin A, Vitamin C, beta-carotene, iron and fiber. I am already dreaming of a bumper crop in late November, in time for the Thanksgiving groaning board.